'Patola' are a type of bound and resist-dyed cloth. An exacting level of technical skill is required to achieve the extraordinary density and complexity of design for which they are so highly prized. In India, 'patola' saris had special significance and were used by certain communities for weddings and important life ceremonies. In Indonesia they were symbols of rank and prestige, and were valued gifts in social and political exchanges. But they were also regarded as ritual and magical cloths, their significance indicated not only by the manner in which they were preserved as heirlooms but by their influence on local textile design and production. 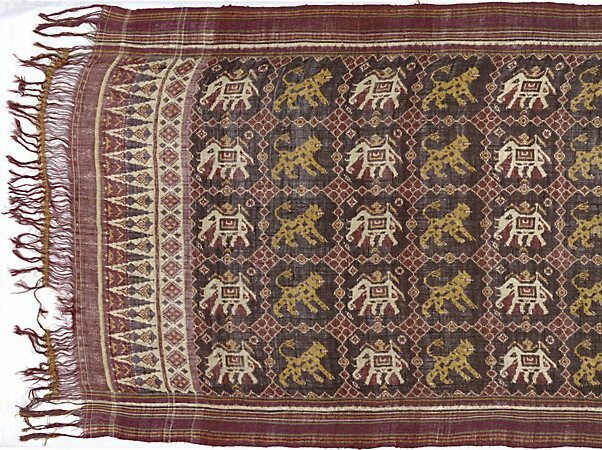 The repeated elephant and tiger motif on this 'patolu' is one of the major design types exported to Indonesia, predominantly Bali and Java. This design was highly prized, particularly in the courts of Central Java, where its use was restricted to princely houses. Other popular design motifs included variations on floral and geometric patterns, which became incorporated into the design language of the local textile traditions. The Asian Collections, AGNSW, 2003, pg.342. The Asian Collections Art Gallery of New South Wales , Sydney, 2003, 342 (colour illus.). The colour illus. on page 342 is a detail of this work.